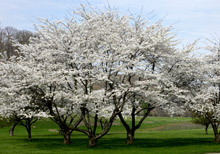 Imagine bright white blooms in your yard when all other trees are a dull green. These semi-double blooms burst with color in the springtime… but what makes this tree so unique is that its flowers appear again in the fall (when other trees are losing their leaves) and during warm winters (when trees are usually dormant). A great choice near gardens, small areas, or anywhere you would like to add color. Picture having the only tree in your neighborhood that gives you beautiful blooms when the weather turns cold. If you have trouble with flowering trees in your area, try the Autumn Flowering Cherry. It can grow almost anywhere. Currently shipping as a 1-2' bare root tree.